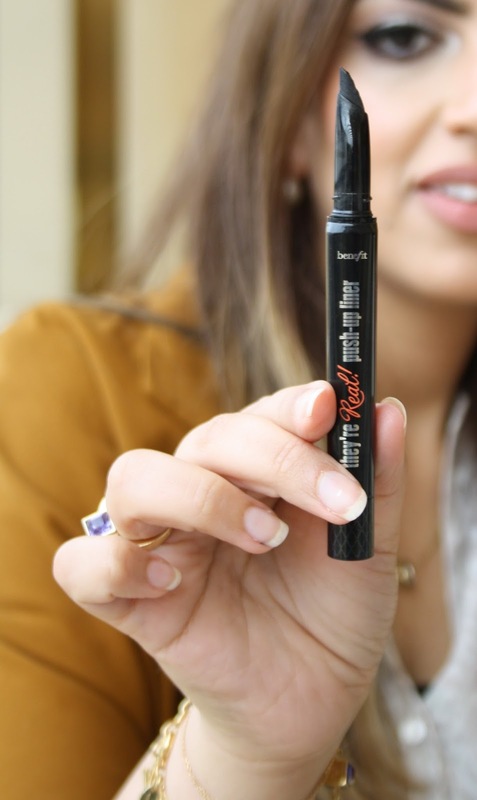 Finally we got to sample out Benefit They're Real Push-up Liner.. In simple words it's a long lasting gel eyeliner that comes in a shape of a pen, and has a sharp edge to draw a perfect line .. Supposedly it makes winged eyeliner a lot easier and it manages to closely hug the lash line for more definition.. However, Nora found it a bit tricky to complete the wing as it doesn't glide easily on the lid to do so.. But it might be helpful for a beginner who likes just a subtle line rather than anything exaggerate.. I've also gave it a test drive myself, since I'm such a sucker when it comes to perfecting my wing. I found it a bit hard to control the amount of gel coming of the pen it's either too much or too little which kills the wing halfway . The tip is also made out of rubber which I found a tad bit wide for smaller eyes. The formula is quite dark and foul proof even my eye make-up remover wasn't enough to clean it later so I suggest something oil based for removal.. The eyeliner also comes with it's own remover, I guess it makes sense..